Again, Concerto Köln, wow. Ever heard of Gaetano Brunetti (1744-1798)? I hadn’t, outside of this recording, released in 1994 but which I only come to now. He’s one of those Italian composers who was attracted by the blossoming musical life at the Court of Spain under its French-originated (scions of Louis the 14th), often Italy-educated and music-loving reigning family– most famous being Domenico Scarlatti and Luigi Boccherini. While Scarlatti had in fact followed Barbara infanta of Portugal when she was married to future king Ferdinand VI (who reigned from from 1746 to 1759) and Boccherini had been at the service of Luis Antonio, Ferdinand’s son and the younger brother of King Charles III (whose reign lasted from 1759 to 1788), Brunetti had been the violin teacher of Charles’ son, the future Charles IV (reigning from 1788 to his abdication in 1808). Brunetti’s biography is very sketchy and somewhat complicated by the fact that there seems to have been two musicians in that era going by the same name, one born in Fano in 1744 (and that would be this one), and one in Pisa in 1753 – and it is the latter, a violinist in Salzburg, that Mozart refers to in his letters to Leopold from 1778. In fact, describing Brunetti as an Italian composer established in Spain, like Scarlatti and Boccherini, may be stretching the facts a bit, since, apparently, it was his father, himself a musician, who moved to Spain (that Gaetano was born in Fano is only a conjecture, based on the fact that his father, Stefano, was). Gaetano’s presence in Madrid is first recorded in 1760, which makes him only 16-years old then, so part of his musical training and influences must have been genuinely Spanish. Thereafter he was very active in the court circles until his death, but very little of his music was published, which helps explains his obscurity for the centuries to come. It is conductor Newell Jenkins who first tried to initiate a Brunetti rediscovery, publishing some of his symphonies (Nos. 22 in G minor and 33 “Il Maniatico” in 1960, Classici italiani della musica 3, Rome; No. 23 in 1966, Clarion 18th Century Music Series, Schirmer, New York; and a batch of nine more, Nos 9, 16, 20, 21, 26, 28, 34, 35 and 36, in 1979, in The Symphony, 1720-1840, ed by Barry S. Brook, Series A vol. V, Garland Publishing New York) and recording a number of them (22, 31, 33, and an un-numbered one in C-minor) for the Haydn Society in 1953 and 1954 (see complete references at the end of this review), and again No. 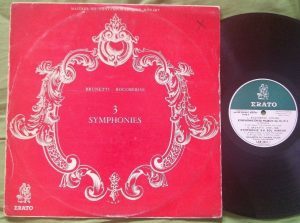 23 in 1967 (paired with a Symphony of Joseph Martin Kraus) on Nonesuch H-1156 (mono), H-71156, “Music for Kings”, with the Angelicum Orchestra of Milan. 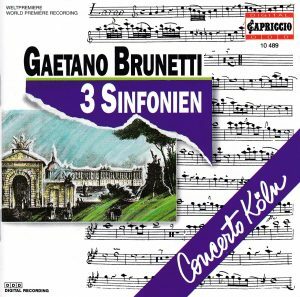 But that early effort seems to have petered out, and nothing was heard of Brunetti, in the record catalogs Brumel segued to Bull, until this recording of Concerto Köln. Since their formation in 1985, Concert Kökn have also made a specialty of those rediscoveries of composers from the late baroque, classical or early romantic era, now forgotten or considered minor, and their contribution has been invaluable, with CDs devoted (by chronological order of release) to musicians of the French Revolution, Kraus, Durante, Dauvergne, Arriaga and other Spanish composers, Locatelli, Dussek, Salieri, Rosetti, Vanhal, Dall’Abaco, Field, Stamitz and the Mannheim composers, Eberl, Kozeluch, Gossec, Wilms or Myslivecek. I’ve waxed enthusiastic about many of those recordings, and I’m even more bowled over about this one. My insistence on establishing the “nationality” of Brunetti – an Italian composer established in Spain, or a Spanish composer? – may seem somewhat jejune, in view of the cosmopolitism of the Spanish royalty at the time (the Kings of Spain at that time were in fact French, and raised in Naples) and also of the obvious willingness of foreign composers, like Scarlatti and Boccherini, to let the influences of vernacular music percolate. Hard to claim that Scarlatti’s sonatas, or Boccherini’s Ritratto Quintet are indebted to the “Italian style” – whatever that may be. But in the case of Brunetti, there’s more, there’s the fact that some elements of style, form and character seem entirely genuine and can be retraced to no “mainstream” formal models in force in the music centers of Europe that I can establish. In that sense, the music sounds, indeed, entirely vernacular, grown in a place – or in a creative mind – not entirely pervaded by foreign influences and models. The first movements of Symphonies No. 26 and 36 start with slow introductions, filled with great pathos in 36, more in the style of a march or a curtain lift in 26, and the slow introduction even returns unexpectedly to conclude the first movement of 36 – now wait, a cyclical form, who else did that in the Classical era (and of course, wouldn’t you know, only a few days after these Brunetti Symphonies, I listen to the string quartets of another unknown composer from the classical era, Maddalena Lombardini Sirmen, and one of the movemenents uses exactly the same process…) ? These introductions are followed by (and Symphony No. 22 it starts with) Allegros of extraordinary boisterousness and energy, and great melodic appeal and invention, and the Finales are in the same vein (no surprise that four of those Allegros should bear the tempo indication “Allegro di molto”, and one “Allegro vivace”). The works are richly orchestrated, always adding 2 oboes, bassoon and 2 horns to the strings, and those woodwinds aren’t just there for harmonic filling, the assume solo roles within the course of the movements (for instance bassoon in the opening Allegro of 26, oboes and horn in the Andantino amoroso of 22, all five instruments in the Largo of 26). The “slow” movements are filled with great elegance, and a pathos that I find all the more effective as it is never heart-on-sleeve. The instrumental originality is never more in evidence than in the third movements – those that take place of Menuetto or Scherzos –, whose outer sections are in the form of a quintet for winds, and trio is scored for strings alone, a vigorous dance in Spanish character in 26 and 22, and in a more brooding atmosphere in 36 – and always very short, never milking it. I don’t know who else in that era or later dared that combination. Well done Brunetti! I’d need to hear more Brunetti, and more aspects of his output, instrumental, chamber, vocal and sacred, before I can make any informed pronouncement on his worth, but based on those three symphonies, hey, this looks like he may be your major unknown composer of the classical era, one of unparalleled originality and with no peer that I can think of. I’m tempted to say that he shouldn’t have buried himself in Spain but should have gone to Paris instead or entered the service of Prince Esterházy… but of course if he hadn’t been subjected to all those Spanish influences and culture, he probably wouldn’t have composed those symphonies, at least nothing like them. Brunetti’s entry on English Wikipedia is very sketchy, the one in Spanish (contributed in 2009 by a donor who went by the name of Bellerofonte) is very thorough and informed, although it’s something of a muddle on the recordings of Newell Jenkins. It’s been translated to French. There’s also a very complete one on the website Musica de Espana (Encyclopedia of Hispanic Music). It’s also in Spanish, but these are the cases where I hugely appreciate the translator of Google Chrome. It translates into awkward English, but enough to wade your way through and make sense of it. TT 68 minutes. I want to hear more Brunetti. In 2005 the Spanish musicologist Germán Labrador López de Azcona published the summum opus of a critical, thematic and chronological catalog of Brunetti’s works. See this review of it. 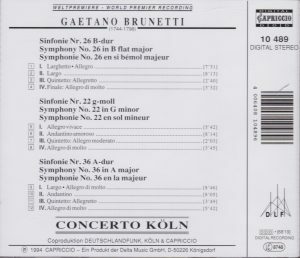 Brunetti’s works are starting to slowly trickle onto CD, especially from Spain (see below). Beware, there’s also a Giovanni Gualberto Brunetti (1706-1787), so if you browse on your usual commercial website, make sure who turns up. Any Stabat Mater is likely to be Giovanni’s, not Gaetano’s. I hope a major Brunetti rediscovery happens before I die. Vol. I 5/6 : Symphony No. 22 in G minor L311 + Viotti: Concerto for Piano and Violin (Carlo Bussotti & Antonio Abussi). Haydn Society HSL-78 (1953), same as above. No. 22 G minor and C minor + Boccherini Symphony op. 35-4, Sammartini Symphony in G major, Haydn Society HS 9019, Erato LDE 3022 (as I write, August 4 2017, a copy of the Erato was on sale on eBay, from… “A rather small village, Israël”. No kidding.